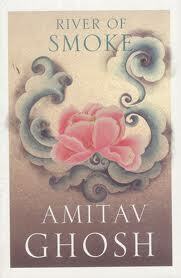 River of Smoke ,the second novel in Amitava Ghosh’s historical trilogy makes for a very compelling read .The Sea of Poppies took you far inland in the Gangetic Plains where poppy was grown and processed and The River of Smoke takes you into the crowded waterways of Canton , China where opium was consumed . A colonial decree favoring the East India Company ensured that the verdant greens of the Plains were replaced by ashen fields of poppy . Amitava Ghosh weaves an almost surreal tale of opium trade , of love affairs , of the exoticism of the sing-song girls & China , of the troubles & travails of the indentured labourers ,of a love child born out of wedlock …. The chaos of those times have been so brilliantly captured that you feel transported to the actual scene . It is as if the scene is unfolding right there in front of your eyes. The battering of the Anahita , the execution at the Maidan , the erstwhile Raja reduced to being a merchant’s scribe . The beauty of the work lies in the rich detailing which is a treat to the sensibilities of the reader . The characters are not portrayed as the quintessential archetypes of their community . Instead Ghosh displays exceptional craftiness in drawing out minutiae of their routine lives , beliefs ,fears and ambitions .The sheer volume of detail is exhaustive and submerges the reader . Bahram Modi consumed by his internal conflicts and rendered helpless due to the embargo on opium trade . Of the tremendous uncertainty that he faces as he pits his life’s earnings & more in bringing the largest ever consignment of opium to China and faces a prospect of bankruptcy and ruin . Of his troubled conscience as he tries to gain profits for himself by unleashing the plague of incorrigible opium addiction on the chinese populace . Of how he is torn between maintaining social propriety and expressing his affection openly for his Love child- Ah-Fatt . Of how he is conflicted with choosing between Ahura Mazda & Ahriman .Of Paulette ‘s retinue of Botanical treasures and their quest for the elusive golden camellia . The wanton disregard of the laws & the brutal arm-twisting of the Chinese by the chamber which was English dominated seems typical of those times . The River of Smoke seamlessly binds fantasy & fiction with history . The tale brings out beautifully sometimes in a sad way the effect of intermingling of lives , cultures ,races , ethnicities & languages in the melting pot that is Canton . However at no place has Ghosh made any judgements on history nor is there any post facto moralization or lamentation . However the pidgin english does come across as a little forced at times . On the whole the River of Smoke is an eventful odyssey into the lives of the numerous ruined due to the illegal trade & the embargo on opium and into those tumultuous times fortunes are as capricious as the winds of the high seas . I just want to mention I am just new to blogs and truly loved you’re web page. Very likely I’m going to bookmark your blog post . You absolutely come with terrific articles and reviews. Cheers for sharing with us your blog site.